Back in the early 30's, winter visitors were coming to Naples to enjoy the sun, the beaches and a small golf course at the end of Fifth Avenue near the beach. Who was the famous individual that landed his plane near the golf course in 1932. For the answer, check the history page. Train service began in Naples in what year? 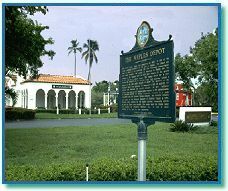 The depot is now a historical landmark. To find the Answer. In 1935, Benny Morris purchased a large area in downtown Naples and renamed it after the original owner. What was the area named? To Find the Answer. Who invented the first swamp buggy?To find the Answer. When did the first 'Official' Swamp buggy race take place in Naples? Check out Swamp Buggy Racing History. When was Collier County where Naples is located first created? Check out Naples' History Page for the Answer. The descendants of the what well known Indian family are now world-renown builders of Chickees (cypress pole constructions with palmetto-thatched roofs)? To find the Answer. What group was responsible for providing Naples with it's first library as early as 1932? To find the Answer. What government building sat where the new Chamber's Visitors Center sits today? To find the Answer. 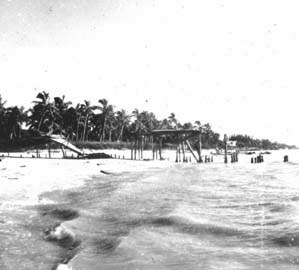 When was the original T shaped pier built in Naples, Florida? To find the Answer. In 1960, during Hurricane Donna, surge water was over the table tops of Beroni's Cafe which was located on where? To find the Answer. What was the first road leading to Naples named? To find the Answer.